Friends’ beliefs are shaping the way Quaker programs serve older adults in many ways and are leading to a positive and uplifting retirement experience. 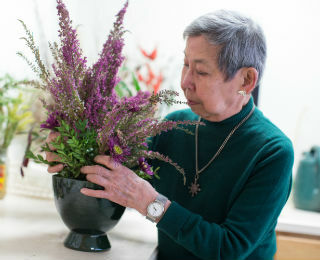 Founded in 1991, the Friends Services for the Aging (FSA) is an organization that helps to support Quaker-affiliated organizations that serve older adults. ● Respecting the dignity of every individual. Each person has physical needs as well as emotional needs. Respecting the dignity of the people served is one of the most important and fundamental values Quakers share. ● A fundamental belief that all people have strengths. And that those strengths can and should be supported. ● All people need to be involved in decisions that affect their lives. Older adults are involved in decisions that impact their lives as well as the decisions that affect the communities they call home. Quaker values have an important and profound effect on the way services are delivered in Quaker-affiliated communities and environments. ● Mutual respect is paramount. In retirement communities, this mutual respect involves members of the staff, families and the residents. ● Fostering social environments that encourage participation. This goes beyond simply encouraging social participation in the greater community. Engaging residents in decision making creates an atmosphere of active participation within the community. ● Involving employees in decision making processes. Employees have great insight as to what’s going on in the daily lives and the direct care of the residents in their communities . It is essential to involve them in the decision making processes. ● Manage finances prudently. Quaker affiliated retirement communities and organizations are not-for-profit organizations and use their funds judiciously and with careful consideration. ● Belief that aging does not negate potential. In fact, the later stages of life are filled with potential. It is this belief that shapes all aspects of Quaker-affiliated retirement communities and shapes the programs offered to the people who live within them. ● Operate under boards governed by Quaker processes. Community governance is based on transparency and consensus building. Quaker values are important to many organizations and communities throughout the country. They promote respect for people and a strong commitment to service, community and dignity. If you share these values, then perhaps you should consider a Quaker-affiliated retirement community as the next place you want to call home.